Have you been participating in Row by Row? What a great time to meet new people, visit new shops and try new techniques! We've had a great time meeting ladies from all over the country and several from out of the country! We also have our winner! 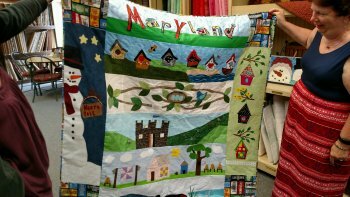 Congratulations to Sandy Andrejak for turning in her finished quilt! She won 25 fat quarters and a $25.00 gift card from Hoppin Bobbin for using our row. She was even kind enough to let us hang it in the shop, stop by and see it! This wreath can have three fabrics or hundreds, it’s up to you the piecing goes quickly and the blocks nest together well. A nice throw for the holidays or gift for a loved one, you should be finished or close after this class. The sample is hanging at the shop and is stunning. 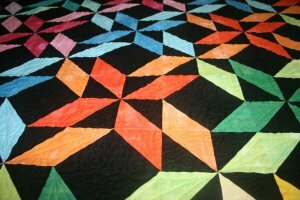 This is pattern is simple enough for a beginner and intriguing for the seasoned quilter. Come join us in the making of this beautiful quilt! Bring a lunch to eat during class. 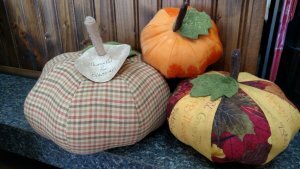 Learn the fun art of making seasonal or holiday bowl fillers with Tracy. These uniquely designed harvest pumpkins can be used within a bowl or stand alone on your seasonal table. As an added bonus in this class you will also make a small bunch of carrots with Tracy Franz. 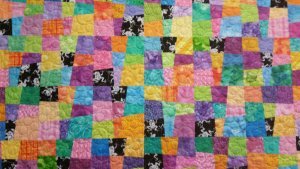 Join Jamie Lichner in learning how to make this fun quilt, using many colors or go monochromatic. Great stash buster quilt to use up any fabrics you can get a 9" square out of, or use a layer cake!